This workshop provides the answers you need by focusing on Policies and Procedures (Standard 6) and the Organizational and Program Resources (Standard 7). 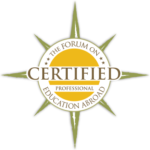 The Forum on Education Abroad’s workshops focus on issues of concern to the field of education abroad. Through discussion and analysis of specific case studies participants will explore how these two Standards can assist an organization in attaining more effective use of resources through the proper implementation of policies. 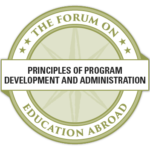 This qualifies as a Forum Certification Workshop and Principles of Program Development and Administration Competency.